Unlike the Spanish milled dollar, the U.S. dollar is based upon a decimal system of values. In addition to the dollar the coinage act officially established monetary units of mill or one-thousandth of a dollar (symbol ₥), cent or one-hundredth of a dollar (symbol ¢), dime or one-tenth of a dollar, and eagle or ten dollars, with prescribed weights and composition of gold, silver, or copper for each. It was proposed in the mid-1800s that one hundred dollars be known as a union, but no union coins were ever struck and only patterns for the $50 half union exist. However, only cents are in everyday use as divisions of the dollar; "dime" is used solely as the name of the coin with the value of 10¢, while "eagle" and "mill" are largely unknown to the general public, though mills are sometimes used in matters of tax levies, and gasoline prices are usually in the form of $X.XX9 per gallon, e.g., $3.599, more commonly written as $3.59​9⁄10. When currently issued in circulating form, denominations equal to or less than a dollar are emitted as U.S. coins while denominations equal to or greater than a dollar are emitted as Federal Reserve notes (with the exception of gold, silver, platinum and palladium coins valued up to $100 as legal tender, but worth far more as bullion). Both one-dollar coins and notes are produced today, although the note form is significantly more common. In the past, "paper money" was occasionally issued in denominations less than a dollar (fractional currency) and gold coins were issued for circulation up to the value of $20 (known as the "double eagle", discontinued in the 1930s). The term eagle was used in the Coinage Act of 1792 for the denomination of ten dollars, and subsequently was used in naming gold coins. Paper currency less than one dollar in denomination, known as "fractional currency", was also sometimes pejoratively referred to as "shinplasters". In 1854, James Guthrie, then Secretary of the Treasury, proposed creating $100, $50 and $25 gold coins, which were referred to as a "Union", "Half Union", and "Quarter Union", thus implying a denomination of 1 Union = $100. In the 16th century, Count Hieronymus Schlick of Bohemia began minting coins known as Joachimstalers, named for Joachimstal, the valley where the silver was mined. The German word for valley is thal, or nowadays usually Tal (cognate with "dale" in English). St. Joachim's Valley is now known as Jáchymov, in the Czech Republic (then part of the Kingdom of Bohemia). Joachimstaler was later shortened to the German Taler, a word that eventually found its way into many languages, including Danish and Swedish as daler, Norwegian as dalar and daler, Dutch as daler or daalder, Ethiopian as talari, Hungarian as tallér, Italian as tallero, and English as dollar. Alternatively, thaler is said to come from the German coin Guldengroschen ("great guilder", being of silver but equal in value to a gold guilder), minted from the silver from Joachimsthal. The coins minted at Joachimsthal soon lent their name to other coins of similar size and weight from other places. One such example, was a Dutch coin depicting a lion, hence its Dutch name leeuwendaler (in English: "lion dollar"). The leeuwendaler was popular in the Dutch East Indies and in the Dutch North American New Netherland Colony (Tri-State area), and circulated throughout the Thirteen Colonies during the 17th and early 18th centuries. It was also separately popular throughout Eastern Europe, where it led to the current Romanian and Moldovan currency being called leu (literally "lion"). 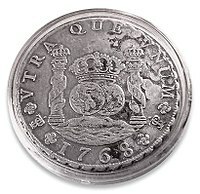 Among the English-speaking community, the Dutch coin came to be popularly known as lion dollar – and is the origin of the English dollar. The modern American-English pronunciation of dollar is still remarkably close to the 17th-century Dutch pronunciation of daler. The colloquialism "buck"(s) (much like the British word "quid"(s, pl) for the pound sterling) is often used to refer to dollars of various nations, including the U.S. dollar. This term, dating to the 18th century, may have originated with the colonial leather trade. It may also have originated from a poker term. "Greenback" is another nickname originally applied specifically to the 19th-century Demand Note dollars created by Abraham Lincoln to finance the costs of the Civil War for the North. The original note was printed in black and green on the back side. It is still used to refer to the U.S. dollar (but not to the dollars of other countries). Other well-known names of the dollar as a whole in denominations include "greenmail", "green" and "dead presidents" (the last because deceased presidents are pictured on most bills). American Eagles originally were not available from the Mint for individuals but had to be purchased from authorized dealers. In 2006, the Mint began direct sales to individuals of uncirculated bullion coins with a special finish, and bearing a "W" mintmark. The United States Mint produces Proof Sets specifically for collectors and speculators. Silver Proofs tend to be the standard designs but with the dime, quarter, and half dollar containing 90% silver. Starting in 1983 and ending in 1997, the Mint also produced proof sets containing the year's commemorative coins alongside the regular coins. Another type of proof set is the Presidential Dollar Proof Set where four special $1 coins are minted each year featuring a president. Because of budget constraints and increasing stockpiles of these relatively unpopular coins, the production of new Presidential dollar coins for circulation was suspended on December 13, 2011, by U.S. Treasury Secretary Timothy F. Geithner. Presidential dollars (along with all other dollar coin series) minted from 2012 onward were made solely for collectors. 2016 had Richard M. Nixon, Gerald R. Ford, James E. Carter and Ronald Reagan. ^ The letter "P" is used for the Philadelphia mint mark on all coins (except cents) released from 1980 onward. Before this it had only been used on silver Jefferson nickels from 1942 to 1945. ^ Between 1973 and 1986 there was no mint mark (these coins are indistinguishable from coins produced at the Philadelphia Mint from 1973 to 1980); after 1988 the letter "W" was used for coinage, except for the 2009 Ultra High Relief Double Eagle. ^ It is now the home of the Nevada State Museum, which still strikes commemorative medallions with the "CC" mint mark (most recently in 2014 commemorating the Nevada Sesquicentennial), using former mint's the original coin press. ^ Although the mint mark "D" has been used by two separate mints, it is easy to distinguish between the two, as any 19th‑century coinage is Dahlonega, and any 20th- or 21st‑century coins are Denver. ^ During the period in which this mint branch was operational, The Philippines was an insular territory and then commonwealth of the U.S.; it was the first (and to date only) U.S. branch mint located outside the Continental United States. ^ The letter "M" was used for the Manila mint mark on all coins released from 1925 onward; before this it had produced its coins with no mintmark. ^ During the Civil War, this mint operated under the control of the State of Louisiana (February 1861) and the Confederate States of America (March 1861) until it ran out of bullion later in that year; some Half Dollars have been identified as being the issue of the State of Louisiana and the Confederacy. ^ United States dollars, Iranian rials, and Pakistani rupees are widely accepted. ^ Used heavily for large purchases. ^ Bahamian dollar tied at a 1:1 rate to the United States dollar, both are accepted interchangeably. ^ Iraqi dinar tied at about 2:1, both accepted. ^ The United States dollar is widely used alongside the Peruvian sol in tourist-heavy areas. Large purchases are often also denominated in USD. ^ The United States dollar is widely used alongside the Canadian Dollar in the tourist district. ^ a b The United States dollar is widely used by locals. ^ Nichol, Mark. "50 Slang Terms for Money". dailywritingtips.com. Retrieved October 17, 2018. ^ "Central Bank of Timor-Leste". Retrieved March 22, 2017. The official currency of Timor-Leste is the United States dollar, which is legal tender for all payments made in cash. ^ "RMB increases its influence in neighboring areas". en.people.cn. ^ "British Indian Ocean Territory Currency". Wwp.greenwichmeantime.com. March 6, 2013. Retrieved October 17, 2018. ^ "demtullpitcairn.com" (PDF). www.demtullpitcairn.com. Archived from the original (PDF) on May 9, 2016. Retrieved January 3, 2018. ^ "Nixon Ends Convertibility of US Dollars to Gold and Announces Wage/Price Controls". Federal Reserve Bank of Richmond. Retrieved October 17, 2018. ^ "Is U.S. currency still backed by gold?". Board of Governors of the Federal Reserve System. Retrieved October 17, 2018. ^ "The Implementation of Monetary Policy – The Federal Reserve in the International Sphere" (PDF). Retrieved October 17, 2018. ^ "How much U.S. currency is in circulation?". Federal Reserve. Retrieved October 17, 2018. ^ "Paragraph 5 of Section 8 of Article 1 of the Constitution of the United States of America". Topics.law.cornell.edu. Retrieved October 17, 2018. ^ a b c "Section 5112 of Title 31 of the United States Code". Retrieved October 17, 2018. ^ "Paragraph 7 of Section 9 of Article 1 of the Constitution of the United States of America". Topics.law.cornell.edu. Retrieved October 17, 2018. ^ "Section 331 of Title 31 of the United States Code". Law.cornell.edu. August 6, 2010. Retrieved October 17, 2018. ^ "2009 Financial Report of the United States Government" (PDF). Retrieved October 17, 2018. ^ a b National Geographic. June 2002. p. 1. Ask US. ^ "Dutch Colonial – Lion Dollar". Coins.lakdiva.org. Retrieved October 17, 2018. ^ a b "etymologiebank.nl". etymologiebank.nl. Retrieved October 17, 2018. ^ "Buck". Online Etymology Dictionary. Retrieved October 17, 2018. ^ "Paper Money Glossary". Littleton Coin Company. Retrieved October 17, 2018. ^ Aiton, Arthur S.; Wheeler, Benjamin W. (1931). "The First American Mint". The Hispanic American Historical Review. 11 (2). p. 198 and note 2 on p. 198. JSTOR 2506275. ^ Nussbaum, Arthur (1957). A History of the Dollar. New York: Columbia University Press. p. 56. The dollar sign, $, is connected with the peso, contrary to popular belief, which considers it to be an abbreviation of 'U.S.' The two parallel lines represented one of the many abbreviations of 'P,' and the 'S' indicated the plural. The abbreviation '$.' was also used for the peso, and is still used in Argentina. ^ "U.S. Bureau of Engraving and Printing - FAQs". www.bep.gov. ^ James, James Alton (1970) . Oliver Pollock: The Life and Times of an Unknown Patriot. Freeport: Books for Libraries Press. p. 356. ISBN 978-0-8369-5527-9. ^ "The Lion Dollar: Introduction". Coins.nd.edu. Retrieved October 17, 2018. ^ Mint, U.S. "Coinage Act of 1792". U.S. treasury. ^ "United States Dollar". OANDA. Retrieved October 17, 2018. ^ "Engraving and printing currency and security documents:Article b". Legal Information Institute. Retrieved December 19, 2013. ^ Matt Soniak (July 22, 2011). "On the Money: Everything You Ever Wanted to Know About Coin Portraits". Mental Floss. Retrieved October 17, 2018. ^ Newman, Eric P. (1990). 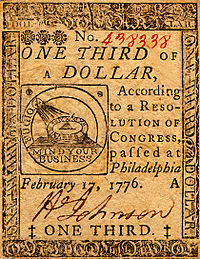 The Early Paper Money of America (3 ed.). Iola, Wisconsin: Krause Publications. p. 17. ISBN 0-87341-120-X. ^ Wright, Robert E. (2008). One Nation Under Debt: Hamilton, Jefferson, and the History of What We Owe. New York, New York: McGraw-Hill. pp. 50–52. ISBN 978-0-07-154393-4. ^ "IRS Court Case Shakes the Foundations of the Debt Money System". Beyondmoney.net. November 8, 2007. Retrieved October 17, 2018. ^ "2015 $100 American Liberty High Relief Gold Coin Photos". July 31, 2015. ^ Christian Zappone (July 18, 2006). "Kill-the-penny bill introduced". CNN Money. Retrieved October 17, 2018. ^ Weinberg, Ali (February 19, 2013). "Penny pinching: Can Obama manage elimination of one-cent coin?". NBC News. Retrieved October 17, 2018. ^ "The United States Mint Coins and Medals Program". Department of the Treasury. Retrieved October 17, 2018. ^ "Section 13 of the Coinage Act of 1792". Memory.loc.gov. Retrieved October 17, 2018. ^ CNN Money Congress tries again for a dollar coin. Written by Gordon T. Anderson. Published April 25, 2005. ^ "Report to the Subcommittee on Treasury and General Government, Committee on Appropriations, U.S. Senate" (PDF). USGAO. Retrieved October 17, 2018. ^ Pub. L. No. 109-145, 119 Stat. 2664 (December 22, 2005). ^ "United States Mint Releases 2012 Presidential $1 Four–Coin Set on June 26". Usmint.com. June 19, 2012. Retrieved October 17, 2018. ^ "USPaperMoney.Info: Series 2017 $1". www.uspapermoney.info. ^ "Paragraph 2 of Section 8 of Article 1 of the United States Constitution". Topics.law.cornell.edu. Retrieved October 17, 2018. ^ "Section 411 of Title 12 of the United States Code". Law.cornell.edu. June 22, 2010. Retrieved October 17, 2018. ^ "Section 5103 of Title 31 of the United States Code". Law.cornell.edu. August 6, 2010. Retrieved October 17, 2018. ^ "Section 5115 of Title 31 of the United States Code". Law.cornell.edu. August 6, 2010. Retrieved October 17, 2018. ^ "St. Louis Adjusted Monetary Base". Federal Reserve Bank of St. Louis. Retrieved October 17, 2018. ^ "The Federal Reserve's Beige Book". The Federal Reserve Bank of Minneapolis. Retrieved October 17, 2018. ^ "Open Market Operations". Federal Reserve Bank of New York. Retrieved October 17, 2018. Open market operations enable the Federal Reserve to affect the supply of reserve balances in the banking system. ^ "Fact Sheets: Currency & Coins". United States Department of the Treasury. Retrieved October 17, 2018. ^ "Section 9 of the Coinage Act of 1792". Memory.loc.gov. Retrieved August 24, 2010. ^ a b c "Measuring Worth – Purchasing Power of Money in the United States from 1774 to 2010". Retrieved April 22, 2010. ^ "Consumer Price Index Frequently Asked Questions". Retrieved October 16, 2018. ^ "Consumer Price Index Frequently Asked Questions". Retrieved October 17, 2018. ^ Milton Friedman, Anna Jacobson Schwartz. A monetary history of the United States, 1867–1960. p. 546. ISBN 978-0691003542. ^ a b "Central Banking—Then and Now". Retrieved October 17, 2018. 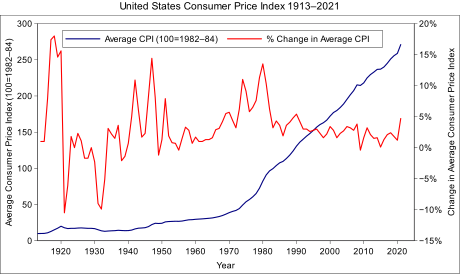 ^ a b c "Controlling Inflation: A Historical Perspective" (PDF). Archived from the original (PDF) on December 7, 2010. Retrieved July 17, 2010. ^ "Monetary Credibility, Inflation, and Economic Growth". Retrieved July 17, 2010. ^ "U.S. Monetary Policy: The Fed's Goals". Retrieved October 17, 2018. ^ "Historical Exchange Rates Currency Converter - TransferMate". www.transfermate.com. ^ "FRB: Foreign Exchange Rates – G.5A; Release Dates". Board of Governors of the Federal Reserve System. Retrieved July 23, 2014. This page was last edited on 25 April 2019, at 04:43 (UTC).